Downloading the App allows you to buy your digital edition. Magazine content can only be accessed with a purchase. 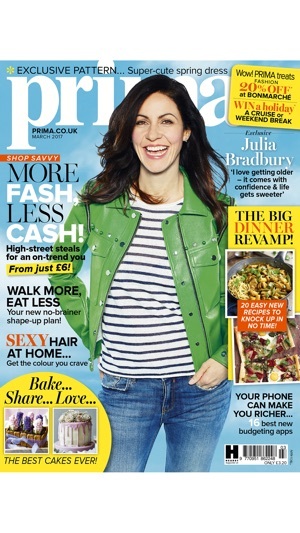 Prima provides real life guidance, inspiration and ideas to simplify the lives of modern women today. It’s packed with tips, tricks, clever ideas and brilliant advice on the key elements in your life. Prima also prides itself on a uniquely dynamic relationship with its readers who are actively involved in everything we do. You can save money off the cover price by choosing to subscribe! By subscribing you’ll never miss an issue and the new editions will automatically download to your Apple device as soon as they are released. Your whole magazine library travels with you and you always have the latest issue even when you’re away from home. Back issues and current issues are available for purchase within the App. Have had this for at least 2 years and it was great. I got Prima Makes as well as Prima, along with a GH Christmas special and other one offs. It was updated recently and I could only access the 6 most recent issues of Prima. Now I can access the last 12 months but none of the other magazines are there and everything I saved has gone. I want to be able to access all the magazines I've read and saved articles from. How is this an improvement? Also, it kept telling me I wasn't a subscriber when I am. Customer support told me to delete the app and reinstall which didn't solve the problem. Eventually had to find my login details, logout and back in again. Now most times I go back to carry on reading, I have to log out again and log back in. Where's all my magazines gone? I bought a subscription to Zest and Prima on my iPad so I could read them when I was traveling but now that I'm away all of my purchased copies have been removed and I'm being asked to pay for them again if I want to view them. I hope this is a bug and not for real, no response yet on my support request though.